Bancroft, East Central Ontario – Bancroft Inn & Suites – The Bancroft Inn & Suites is easily accessed off TOP Trail B106E just north of town (watch for their sign on the east side of rail trail) and provides sled parking in front of rooms, ample trailer parking, continental breakfast, plus gas, convenience store and supermarket just across the road. Owners Tammy & Curtis Martin are avid snowmobilers, so they understand and cater to sledders and can help with any of your snowmobile-related needs – they even have a free shuttle service to the Bancroft Eatery and Brew Pub for no hassle dinners. Good staging location for Bon Echo and Hastings Highlands Tours. View Bancroft snowmobile tour. Barry’s Bay, Eastern Ontario, OFSC District 6 – Spectacle Lake Lodge. This popular lodge has earned a reputation for succulent cuisine and warm hospitality. It provides accommodations in a mix of lodge rooms and cottages, with a restaurant/lounge in the main building (on my list of best restaurants), on site fuel, ample parking and a hot tub. A prime staging destination for the famous RAP (Round Algonquin Park). Direct trail access from Club Trail 159, just south of TOP B, between Madawaska and Barry’s Bay. View RAP Tour article. See Barry’s Bay Snowmobiling. Cochrane, Northeastern Ontario, OFSC District 15 – Thriftlodge. Good roadside motel with hot tub and sauna, sled parking in front of rooms, ample parking, on site restaurant/bar – Terry’s Steakhouse (also on best restaurant list) Located on Highway 11 just south of town. Fuel across the road. Direct trail access from TOP A. Good staging hotel for Abitibi Canyon Tour, Gateway to North Tour and Northern Corridor Adventure. See my Northern Corridor article. View Cochrane Snapshot. Dwight, Muskoka, OFSC District 7 – Spring Lake Resort. This family operated resort specializes in warm hospitality and home cooked meals in the on-site restaurant(see best restaurant list). Ample vehicle and sled parking. Direct trail access via CT 77 just east of Dwight on north side of Highway 60. View snowmobile tour article. Elliot Lake, Algoma Country, OFSC District 13 – Dunlop Lake Lodge. This all-season family resort offers motel-style rooms in the main building with an on site restaurant & bar plus good sled parking. Located on Dunlop Lake about 15 km north of Elliot Lake, it’s accessed by its own spur trail running west off TOP Trail F. Best staging hotel for North Shore Loop. View North Shore Loop Article. Golden Lake, Eastern Ontario, OFSC District 6 – Sands on Golden Lake Inn & Resort. This very hospitable hotel really caters to sledders and offers exceptionally well-appointed and very large rooms. Ask for ground floor to park in front of your door. Great food at the restaurant (see best restaurant list), plus “Sledder’s Lounge” and fuel on site. Direct trail access from TOP B101A. View RAP Tour article. Gravenhurst, Muskoka, OFSC District 7 – Residence Inn by Marriott. Located at Muskoka Wharf on TOP Trail C101D, this classy hotel offers a complimentary full continental breakfast, indoor pool and hot tub, plus suites with kitchens and lots of truck and trailer parking. Several restaurant are within walking distance. Good staging for Muskoka Magic Tour. Gowganda, Northeastern Ontario, OFSC District 14 – Auld Reekie Lodge. Located near Gowganda, this 4-star facility welcomes snowmobilers with a choice of cottages or suites and offers several attractive meal packages. There’s a restaurant in the main lodge and fuel on site (see best restaurant list). Direct trail access from TOP A107C and Gold Rush Tour. View Gold Rush Snowmobile Tour Planner. Halfway Haven Lodge, Algoma Country, OFSC District 13 – Located between Searchmont & Wawa, this rustic stop over with a hunt camp ambience provides great hospitality, comfy rooms and tasty home made meals on TOP Trail D. Plus, with no fuel available in Searchmont, gassing up at Half Way Haven is a must! Haliburton, Haliburton Highlands, OFSC District 6 – Pinestone Resort. This full service resort, located on County Road 21 just south of the town of Haliburton, offers excellent food in the Heatherwood Restaurant and pub fare in the Highlanders Bar, plus well-appointed rooms, a full service spa and wellness/fitness centre with indoor pool. For families and groups, Pinestone offers a variety of villa and chalet options. Ample vehicle and secure sled parking. Direct trail access via Club Trail 7. View snowmobile tour article. View 2nd snowmobile tour article. Hearst, Northeastern Ontario, OFSC District 15 – Companion Hotel Motel. Sauna, heated sled garage and on site restaurant and bar make this bilingual hotel a good stay. Direct trail access from TOP A (cross railway tracks near town and take 1st local trail on left, which leads to fuel/convenience store and to the hotel at the end.) Good staging hotel for Missinaibi Expedition Tour. View Northern Corridor article. Kapuskasing, Northeastern Ontario, OFSC District 15 – Comfort Inn. Located in town right across form TOP A, this hotel offers ground floor rooms with sled parking in front and continental breakfast. Gas and restaurants nearby. Good staging hotel for Lumberjack Loop. Kearns, Northeastern Ontario, OFSC District 14 – Cheminis Lodge. This charming gem of a lodge is located 40 kilometres east of Kirkland Lake, making it a great jumping off point for a ride into Quebec. Clean rooms, hearty meals, sled garage, outdoor hot tub and great hospitality makes it feel like your home away from home. Ample parking. Direct trail access from TOP A110Q. Kirkland Lake, Northeastern Ontario, OFSC District 14 – Comfort Inn. The Comfort Inn is a convenient place to stay on the Gold Rush Tour. Trail accessible by signed local trail off TOP A110Q, this hotel provides complimentary hot breakfast and sled parking in front of ground-floor rooms. There’s also free truck and trailer parking across the street and restaurants are just a short taxi ride away. Mattawa, Northeastern Ontario, OFSC District 11 – Valois’ Motel & Restaurant. Owner operated roadside motel that backs onto the Ottawa River offers clean, comfortable rooms with sled parking in front, onsite restaurant with scrumptious home cooking (see best restaurant list) and plenty of trailer parking. Direct trail access off TOP A112A, which also leads to gas in town. Good staging for Explorers Snow Tour. View snowmobile tour article. Midland, Bruce Grey Simcoe, OFSC District 8 – Comfort Inn. TOP Trail C runs through the good size parking lot of this conveniently located hotel with sled parking in front of ground floor rooms and free hot breakfasts. Dinner restaurants nearby. Morrisburg, Eastern Ontario, OFSC District 1 – McIntosh Country Inn. This snowmobile-friendly hotel offers on site restaurant, pub, hot tub and plenty of parking. Fuel and convenience store across the road. Direct trail access from TOP A104. Good staging hotel for French Connection Loop. View snowmobile tour article. North Bay, Northeastern Ontario, OFSC District 11 – Travelodge North Bay Airport. Located on Highway 11 and very popular with snowmobilers for tour staging and day loops, this snowmobiler-friendly hotel has ample space for trucks & trailers, plus sled parking in front of ground floor rooms with exterior doors. Hotel offers free continental breakfast and the best direct trail access in town via SSR711 to TOP Trail D. Gas nearby and restaurants within easy walk. Good staging for RAP Tour, RAN Tour and Explorers Snow Tour. View RAN Tour Article. View RAP Tour article. View other snowmobile tour article. Orillia, Bruce Grey Simcoe – Best Western Couchiching Inn. With direct trail access from TOP B112B (follow local trail to its end at hotel) and gas & convenience store next door, the Best Western Couchiching Inn has an on site restaurant and bar, plus a hot tub and sauna, and ample parking out back. Located near the narrows where lakes Simcoe and Couchiching meet, you can do day rides starting by either land or lake trails. See snowmobile tour article. Owen Sound, Bruce Grey Simcoe, OFSC District 9 – Best Western Inn on the Bay. Full service hotel with on site restaurant and bar and 2 hot tubs is located just north of downtown on east side of the bay. Adequate trailer parking at east end of hotel and direct access by local trail (turn at Intersection Marker 144) off of TOP Trail B on the east side of town. Fuel up at Rockford: turn west off of B108 south at the next road south after TOP B swings west off the abandoned rail line. Good staging hotel for Bruce Peninsula Tour, Queen’s Bush Tour, Saugeen River Tour and Walter Falls Tour. View snowmobile tour article. Renfrew, Eastern Ontario, OFSC District 6 – Days Inn Renfrew. Full service hotel with on site restaurant and bar has good trailer parking and direct access by local trail to TOP Trail A. Fuel and convenience store next door. View tour article. Pembroke, Eastern Ontario, OFSC District 6 – Best Western Pembroke Inn. This full service hotel caters to sledders with an on site bar, pool, hot tub and fitness centre. Great food served on site at Westwinds Restaurant (breakfast, lunch and dinner). Fuel and convenience store across the road. Ample parking for sleds at front entrance or at rear exit. Direct trail access from Club Trail 121 off TOP A. View RAP Tour article. See Pembroke Snapshot. Sault Ste Marie, Algoma Country, OFSC District 13 – Fairfield Inn & Suites. One of the few city hotels with direct trail access, the Fairfield Inn & Suites is located on the Trans Canada Highway (called Great Northern Road in SSM) beside Boston Pizza and a gas station. TOP Trail D130 goes right out of the back parking lot where there’s plenty of truck & trailer parking. Free continental breakfast plus indoor pool and whirlpool. View tour article. Searchmont, Algoma Country, OFSC District 13 – Driftwood Valley Chalets. This rustic resort offers two fully equipped housekeeping chalets and ample truck & trailer parking for a homey start to your All The Way There Tour. There’s no gas in Searchmont, so fill up in Sault Ste. Marie before arriving at Driftwood. Staging from Searchmont shortens your All The Way There Ride by two days. View tour article. Sudbury (City), Northeastern Ontario, OFSC District 12 – Moonlight Inn & Suites. 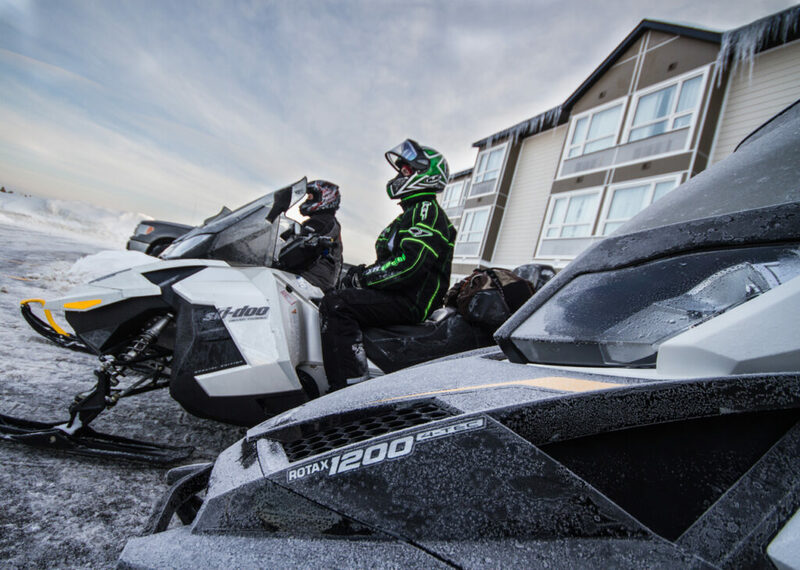 This cozy and convenient roadside property is the ideal staging motel for snowmobilers who want to stay in town while riding Sudbury’s three great loop tours. Located on the east side right beside TOP Trail C109D (at Highway 17), the Moonlight Inn & Suites offers continental breakfast, free WIFI, fridges & microwaves, plus easy access to nearby restaurants. There is no better motel for staging or trail access in Sudbury! Good staging for Cartier Moose Loop, Chiniguchi Wolf Loop and Rainbow Elk Loop. View snowmobile tour article. Sundridge, Explorer’s Edge, OFSC District 11 – Caswell Resort. With rooms in the main building or in lakeside motel units, this historic resort is located on Bernard Lake where access is from the staked ice crossing of TOP Trail C104D. Parking’s tight, but there’s an indoor pool, hot tub and gym, plus on site restaurant. View Sundridge Ride Planner. Temiskaming Shores, Northeastern Ontario, OFSC District 14 – Quality Inn. Located on Highway 11, this popular staging hotel is a full service facility with ample parking for trucks and trailers, plus all the amenities for snowmobilers: on site restaurant/bar, indoor pool, sauna and (great) hot tub, games room, sled parking in front of rooms, and fuel/convenience store next door. Direct trail access via A107Q. Best staging hotel for Gold Rush Tour View snowmobile tour article. Temiskaming Shores, Northeastern Ontario, OFSC District 14 – Waterfront Inn. This renovated hotel overlooks Lake Temiskaming and provides a good staging point for the Gold Rush Tour. Access is easy. By sled, just follow the beaten tracks down the Wabi River to the lake and hang a right around the marina to the hotel or follow the Trail L184 stake line north from Haileybury. The Waterfront Inn has Rooster’s restaurant on site, offers complimentary continental breakfast, and provides access to pool, sauna and hot tub. Ski-Doo dealer and gas station in sight of hotel. Timmins, Northeastern Ontario, OFSC District 14 – Cedar Meadows Resort & Spa. Quebec-style inn with well-appointed rooms and chalets, on site restaurant & bar, plus secure sled parking. Don’t miss the fantastic new luxury spa facility with steam room, sauna and outdoor hot pool. Ample space for trucks & trailers. Be sure to leave time to visit the on site wildlife park! Direct trail access off TOP C just north of intersection with TOP A111C and for Gold Rush Tour. Fuel south on TOP C about 3 km. View Northern Corridor article. Walter’s Falls, Bruce Grey Simcoe, OFSC District 9 – The Falls Inn & Spa. As its name implies, this elegant inn backs on to scenic Walter’s Falls and offers both well-appointed rooms and succulent meals. Located on Club Trail R500 on the Walter’s Fall Tour, it provides ample parking and you can even book a massage! View snowmobile tour article. Wawa, Algoma Country, OFSC District 13 – Wawa Motor Inn. Accessed by road from TOP D, this lodging has both motel units and chalets with sled parking in front. On-site restaurant & bar plus ample truck parking, with fuel and convenience store across the street. Best staging hotel for Top Secret Boondocking. View Algoma Tour Article. Please reconfirm the routes and services in this article as they may have changed since publication.